The web form to collect the data (as part of an online script). 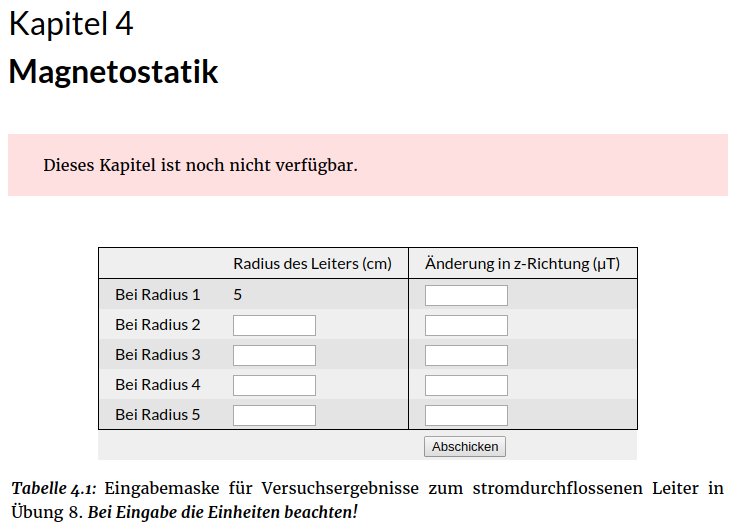 I just had a look at the data of our latest experiment assignment for our students. Just like in our previous collective measurement of pendulum frequencies, the students were supposed to submit their results through an online form, so we can combine all the data to test a model that will be discussed in an upcoming lecture. This time, they should measure the magnetic field generated by a current loop. 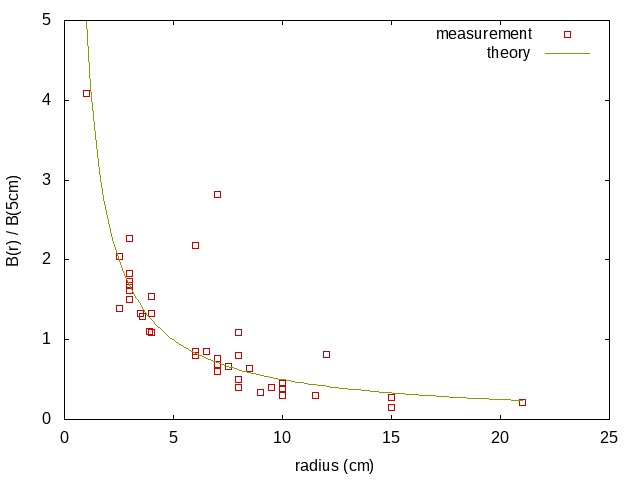 Since we do not know the actual current used in this experiment (at 1.5V this still depends on the cable and the battery’s internal resistance), we told them to include one measurement at a radius of 5cm and plotted the ratio B(r)/B(5cm) of the B field at any radius to the one at 5cm, to eliminate this unknown. Also, the plot only shows the absolute value as some students submitted negative changes. I am quite satisfied with the results and am looking forward to the lecture in which we can presented the collective data to the students. 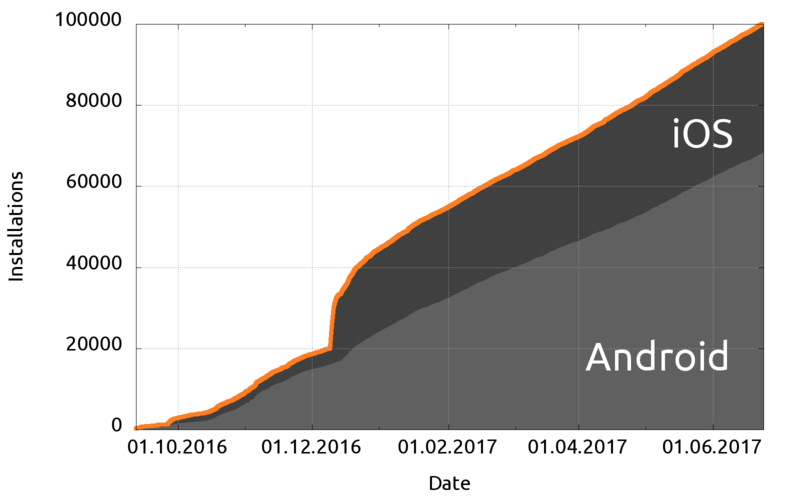 Woohoo, we have reached 100.000 installs (combined, Android and iOS) in less than a year. This is so amazing, thanks to you all! 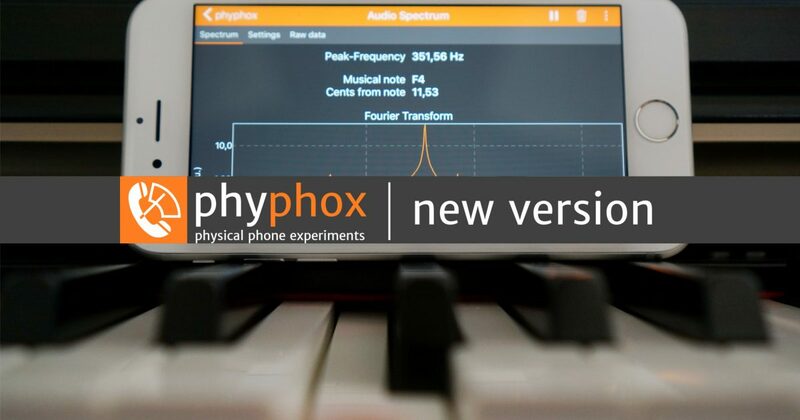 Please help us spread the word about phyphox even further by sharing your favorite experiment, a tweet/post/youtube video or just a link to our site with friends and colleagues – on the web or face-to-face. While we are already working on the big stuff like zoomable graphs, we decided to release yet another minor update in-between with some interesting features. Save or share and load experiment states including your recorded data – even across platforms. Audio autocorrelation and spectrum show corresponding musical notes. You can now pick between different number of samples in audio spectrum. New experiments: Accelerometer and magnetometer spectrum. Time period of audio scope is now selectable. Improved algorithm for audio autocorrelation. Audio amplitude can now be calibrated to give sound pressure level in dB. Splash screen with university logo. Move clear function to the action bar as a button. Minor improvements to TalkBack / VoiceOver by adding descriptions to unlabeled buttons. Buffer for acoustic stopwatch and inelastic collision has been increased, which might help on slower phones. Fix crash on Android 7.1 and Android O when reading non-3D sensors (like pressure or light). Fix crash when rotating while the description hint starts showing. Fix crash on bad experiment icons in main menu. Fix crash on consecutive Fourier transforms. Code has been converted to Swift 3. Ideally, there should be no noticable change. Ideally. Old, discontinued audio engine has been replaced. Fix: VoiceOver stopped working when phyphox handled audio. University logo added to credits dialog. Allow initializing buffers using a list of values. Add mapping of ranges to value element to show text instead of numbers. Add accuracy channel to sensors (magnetometer only). Allow for dynamic sleep times of analysis cycles. New analysis modules: round and log. Fix handling of start value in subrange module. Fix on Android: FFT module now uses actual number of data points instead of just the buffer size. Fix on iOS: Button elements could not use buffers as inputs. The editor and Wiki entries will be updated over the next few hours.